Please refer to our stock # 1007 when inquiring. 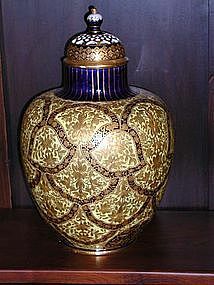 Beautiful covered, reticulated, Royal Crown Derby potpourri jar with exquisite heavily decorated gold design over cobolt blue and pale yellow. Measures 14" tall x 8" wide. Minor loss to gold in a couple of places, but otherwise in perfect condition.